Alex Sparrow is a super-agent in training. He is also a human lie-detector. Working with Jess, who can communicate with animals, they must find out why their friends – and enemies – are all changing into polite and well-behaved pupils. And exactly who is behind it all. Alex Sparrow is full of farts, jokes and superhero references. Oh, and a rather clever goldfish called Bob. In a world where kids’ flaws and peculiarities are being erased out of existence, Alex and Jess must rely on what makes them different to save the day. Have you ever wanted to be a secret agent? A bad-A, undercover, villain-busting super spy, like Nick Fury, the top dog at Marvel’s S.H.I.E.L.D agency? Well. don’t get your hopes up – it takes a special kind of person and years of training to get that job. I’ve been working on it since I was four and up till a few months ago being accepted into S.H.I.E.L.D still seemed a long way off. Sure you can do a hundred star jumps a day to make you strong, and keep chasing the scabby cat from next door out of you garden to make you quick, but some spy skills are a bit harder to come by. 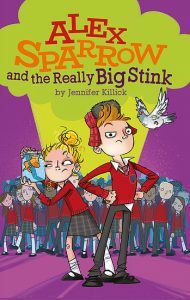 In this hilarious début from Jennifer Killick, we find out how Alex Sparrow comes to learn some spy skills he wasn’t expecting. Not only those, but a great deal more besides – to do with friendship, conformity and prejudice. Just look at Heath McKenzie’s great cover. How serious and worthy could the message be? The awful Miss Smilie and her PALS would definitely not approve. (BTW I promise you the pigeon and the goldfish deserve their star status.) Kids’ TV channels – turn this into a cartoon as soon as you can: I can so hear Alex’s voice-overs. You’re going to love this if you have a sense of humour that tends to the ridiculous, like school-based mysteries, and friendship stories. Add in some truly daft narration from Alex, Jess’s fab retorts (she may well be my favourite character, though Darth Daver comes close) and at least one oh-my-will-it-be-alright-in-the-end? moment – and you’ve got a big-hearted comedy caper of a story. I am delighted to report there’s a sequel to come: Alex Sparrow and the Furry Fury – involving more animals with attitude and an unexpected enemy. Meanwhile, explore Jennifer’s own website for bonus material. This entry was posted in Review and tagged Alex Sparrow, GEA, Jennifer Killick, MG by KMLockwood. Bookmark the permalink.